A surprise father's day present. This chair had extensive water damage. It was our customer’s grandmother’s and she wanted to give it to her husband as a surprise. 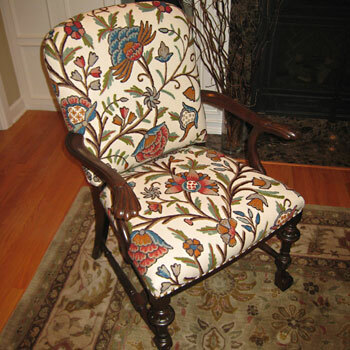 The chair was beautiful and was made of solid mahogany. 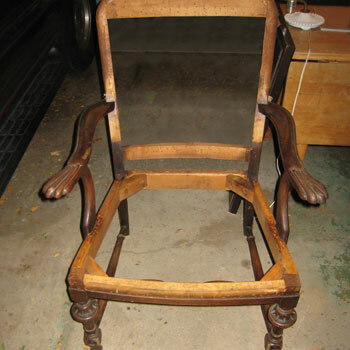 The water damage had caused the chair to become moldy and it had to be stripped to the bare frame and sanitized. A complete overhaul was needed. The frame was taken apart and reglued. The chair was old and made for shorter people in an earlier time. We added 2 ½ inches to the legs to make it more comfortable to use at the dining room table. The wood was stripped and refinished. Our customer had some hand embroidered fabric that a friend had made and that she wanted to use. We used high quality foam and padding on the frame and applied the fabric over this new padding. The result was beautiful. She gave it to her surprised husband for father’s day and he now proudly uses it at the dining room table.